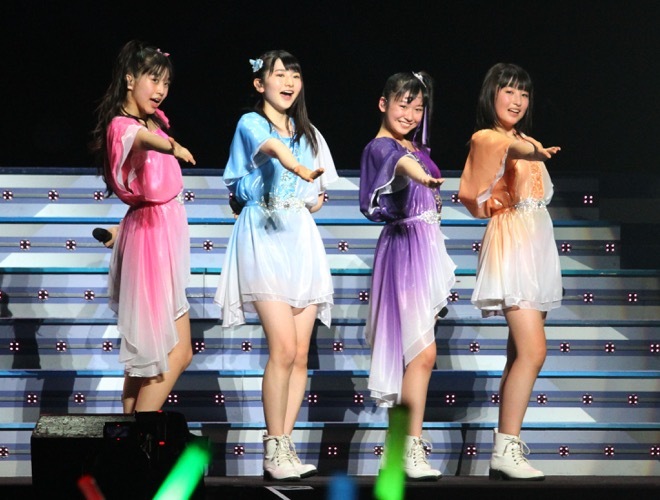 Wrapping up the final leg of the Morning Musume。´15's Spring GRADATION tour at the Nippon Budokan, the 12th gen who were announced there in September last year have now been part of a performance at the Budokan. Here are their comments to the fans. We, the 12th gen, were introduced at Budokan last year, but today, being able to participate in our first Budokan performance as members of Morning Musume。, I truly enjoyed it. Thank you very much for today. Standing on the Budokan stage like this today, it brings back memories of when I joined, through the announcement of the 12th gen members. Becoming a member of Morning Musume。is Maria's greatest joy. Thank you very much for today. Just as Akane-chan and Maria-chan said, this Budokan is the place where the 12th gen made our first appearance, and being able to perform here today fills me with happiness. But, there's still room for Nonaka to grow, so please watch over me warmly. “Morning musume。 It is fantastic! ” (Note: The preceding quote was said in English) . Thank you very much for the truly enjoyable time today. When this tour started, I honestly wasn't used to introducing myself as a member of 'Morning Musume。´15', but having received support from the fans, and having talked a lot with the members, this was a tour that fired up my feelings of being part of Morning Musume。 Morning Musume。´15's Ogata Haruna will continue to do my best, so I beg for everyone's kind support. Thank you so very much for today. 'As the final day, getting to stand here, at the Nippon Budokan, it truly makes me happy. Thank you very much. When the decision for this Nippon Budokan performance was made, I was uneasy, I felt worried, was it too soon for us? But I strongly felt that we shouldn't let this chance slip by, I believed that Morning Musume。could go that far, so we've been doing our best with all we have the whole time. We've gone to various places from the first day of the tour, and we've been supported by all sorts of fans, which built up our confidence. And finally getting to see this lovely view at the Nippon Budokan at the end, I'm truly glad. (Overcome with emotion at the sight of pink glowsticks shining from the audience seats) Pink... I'm happy. Thank you very much. However, we're still getting started, so I think I'd like to have more of the colours of all 13 of us, so please light up glowsticks in our 13 colours. Thank you so very much.